The Overlord is a competitive blog run by Seprix, about the board game Dominion by Donald X. Vaccarino. A musician and a mostly terrible Dominion player. The Secret Life of Walter Hermitty. Hermit (and by extension Madman) seems to continue being undervalued. Every month brings a new tale of the exploits of Madmen taking opposing decks from seemingly behind to rapidly ahead. This is because Hermit is seen primarily as a trasher and gainer, but not as a deck accelerator. It’s time to change that outlook. The single strongest thing about Hermit is the ability to get Madmen. Doubling handsize (after playing Madman of course) with a +Action is one of the strongest effects in the entire game, on par with Donate, City Quarter and King’s Court. It’s no wonder that Madman is a one shot. The strength of the effect largely depends on the amount of cards in hand. If a hand gets discard attacked to three cards, Madman will only be as good as an Encampment. If a Laboratory is played, the Madman will draw 5 cards. Madman play typically starts with at least a single Hermit open, although Double Hermit isn’t uncommon either. Play continues and once the Hermit is found, it often is the time to gain a Hermit, buy nothing and gain a Madman. Buying a Silver or even a shiny Action card isn’t usually worth the deck acceleration Madman provides, which might feel counter-intuitive. The trick is, Madman does a number of things well all at once. Firstly, Madman allows for a multitude of options and ideas with the sheer amount of draw it provides, especially when there are multiple Madmen played. Secondly, it gets the deck closer to the shuffle, allowing for quicker access to those same powerful cards gained on the previous turn. In short, Madman accelerates the deck. The single greatest gift with Madman is gain and play abuse, and Madman already comes prepackaged with a gainer in Hermit. Abusing gain and play is exactly why combos such as Hermit/Market Square work so well, which will be discussed shortly. Any time Madman is on the board, always look for opportunities to gain and play cards. Even in the absence of gain and play, having things to do on the Madman turn is crucial. Maybe there’s some trashing or remodeling to do. Maybe a second buy could be thrown in there. Always have a reason to get Madman. In addition, the cost to get Madman isn’t even that high. Skipping a buy is already what Tactician does. Just be sure to draw Madman at the top of the shuffle. If the Madman bottomdecks and the opposing player draws it at the top of his shuffle, he’s way ahead, just because he got to blow up sooner. That is a real risk with Madman, but the alternative is instantly losing. However, there are some ways to mitigate this. With Watchtower in hand, or buying Traveling Fair, topdecking Madman becomes viable, and a player won’t risk simply losing to Bottomdeck Syndrome. In addition, gainers such as Horn of Plenty and Alms allow for a Madman gain while getting cards like normal. Both of these specific situations quickly lead to some pretty fast game states, and it is often losing to ignore. Scheme works in an interesting way, to where if Scheme topdecks a Hermit after not buying anything, a Madman is gained without losing the Hermit. Events and Projects also combo well with Hermit and Madman gaining, due to Landscapes not being cards. The next question is a much trickier one, and that is how often is Madman gained? Usually the safe answer is just one, but that isn’t always the case. I’ve built decks with Monastery and Banquet (Monastery killing the Coppers gained in play), getting multiple Madmen and drawing deck where it wasn’t ordinarily possible every turn as a result. I didn’t keep going until the Hermits were empty. At a certain point, I made the call that buying cards normally was worth more than the one shot of Madman without the flexibility of buys. That call was made way later, but that is the call that has to be made every time a new Madman is considered. Maybe there’s a megaturn, or maybe there’s just that much stuff to do, or maybe the cost opportunity is low to keep Madmen around. But always have a reason to get Madman. A useless Madman is an expensive one, and inefficiencies lose games. The classic combo with Madman is Market Square, and it is very deadly when executed correctly. Playing it well requires precise play, deck tracking knowledge and a good memory. The open is Hermit/Hermit, and the goal is to try to both win the Hermit split and get an odd number of Hermits in the deck. Nine Hermits is the dream, and also impossible to realistically ever pull off in today’s meta. Seven Hermits is a good goal, but also not likely realistic. After all, the opponent is going to try for the same ideas. Also, do not trash every single junk card in the deck. Those are needed for later. After the Hermit pile is empty or someone has nine/seven Hermits, go for gaining Madmen (sometimes you’ll start on this even sooner) and Market Squares. The goal is to get exactly three more Madmen than Hermits, so the dream combination (as an example for 7 Hermits) is five Madmen and two Hermits. After a bunch of Market Squares are gained and the Madman count is where it should be, pull the trigger on the Madmen. It needs to be timed to where you know you will draw deck when you blow the Madman up. The safest way to do this is to not blow up unless there are two in hand, but with deck tracking it’s possible to know what’s coming up. Once the deck is drawn, blow up the junk card with Hermit (and depending on the deck, either gain more junk to blow up with the next hermit or gain something that helps toward winning), react all of the Market Squares, draw back up with a Madman, and repeat over and over until it’s not possible to. Usually even if Provinces can’t be piled there’s a three pile available, which is something to watch for with the 5/5 Hermit split. Quite often it’s Estates, simple enough with two Hermit gains and 6 buys. All in all, the combo requires a lot of finesse and has a lot of moving parts. It is recommended to practice it multiple times solo before ever trying it in a real scenario. This is also without more complicated aspects, such as dealing with junkers, other $3 trashing cards, and other strange scenarios. As always, if you find something good, look for something even better. Of course, there are still things Hermit does well enough on its own. After all, it does trash and gain. 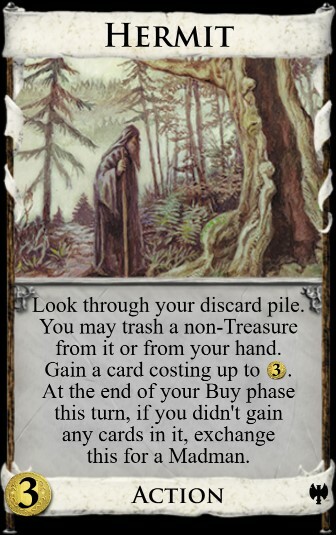 Paired with a treasure trasher, Hermit does plenty of work killing Estates and replacing them with Hermits, Silvers or whatever $3 cost is desired. Hermit helps with pile control. In the rare instance where it matters, Hermit works really well with cost reduction. At the end of the day though, the main strength of Hermit lies in Madman, and mastery of that aspect of Hermit will go a long way towards winning games. Always remember: Hermit is primarily a deck accelerator, and the trash/gain effect is secondary. Recruiter’s art is pretty nice in general. Recruiter is a $5 cost Action that draws two cards, trashes a card, and then supplies as many Villagers as the cost of the card trashed. Bearing strong resemblances to Masquerade in both similarity and power level, Recruiter is already one of the strongest cards in Dominion and is nearly unskippable. Firstly, Recruiter has a leg up on other $5 cost trashers (Junk Dealer, Upgrade, etc.) 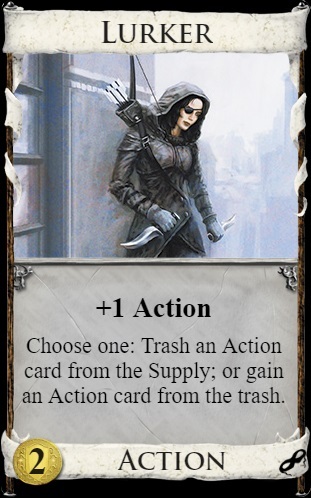 by virtue of the extra card, which provides both more flexibility in trashing as well as cycling. If Recruiter draws Copper and Estate in the early game, it could be thought to be providing a virtual coin, much like Junk Dealer. However unlike Junk Dealer (and most trashers barring exceptions like Sentry), Recruiter does not decrease handsize, which is a valuable trait. As if that wasn’t good enough, Recruiter is also one of the best Villages in the game. Playing a Recruiter and killing an Estate provides two Villagers, which can be distributed to mitigate collisions and play more aggressively. The effect can be likened to a more flexible Encampment. In the same vein as the other $5 trasher variants, if the opening trasher cards are weak enough, it is often a winning play to gun for hitting $5 and buying a Recruiter. Quite often (but not always) it is correct to pick up two Recruiters, one to trash for Villagers and one to trash Coppers. How Recruiters are used and how many are gained depends on the type of deck built. If there are no other Villages, Recruiter is indispensable in providing that support. Extra gains are going to be important in fueling the Recruiter fire, and gainers that provide high cost fuel such as Gold gainers are the absolute best at this. In a pinch, Recruiters themselves are quite fine as fuel, and once most of the Coppers are gone, a Recruiter can be tossed into the Villager fire. In fact, it may end up being the correct play to buy multiple Recruiters just for blowing up, for the extra reliability. After all, Gold doesn’t draw cards, but Recruiter does. Recruiter is not really a draw card in itself, and should not be used as primary draw, but only as a supplement. The forced trashing from an increasing number of Recruiters makes multiple plays very dangerous in the long run, despite the lack of hand decreasing. A notable exception is Fortress, which provides both great draw and is practically a soft Champion with the amount of Villagers that can pile up! Recruiter does a poor job of gaining Villagers with cost reduction, and does not play very well with cards like Highway and Bridge Troll. On the other hand, this defect can sometimes be mitigated with topdecking effects such as Star Chart or Scheme. In addition, if the board contains Shelters over Estates, Recruiter is not as effective in the early game, although this is not too much of a concern in the later stages of the game. If Recruiter was going to be bad in the late game with Shelters, it was going to be bad with Estates anyways. Recruiter is a versatile card that provides a plethora of effects that just by themselves are good, but added together make for one of the strongest cards in the game. If you see Recruiter on the board, it is almost never wrong to pick one up. The earlier you do, the better. Sometimes the best thing to say is nothing. Lurker is a high skill card that is often mistaken for being a more powerful card than it really is. 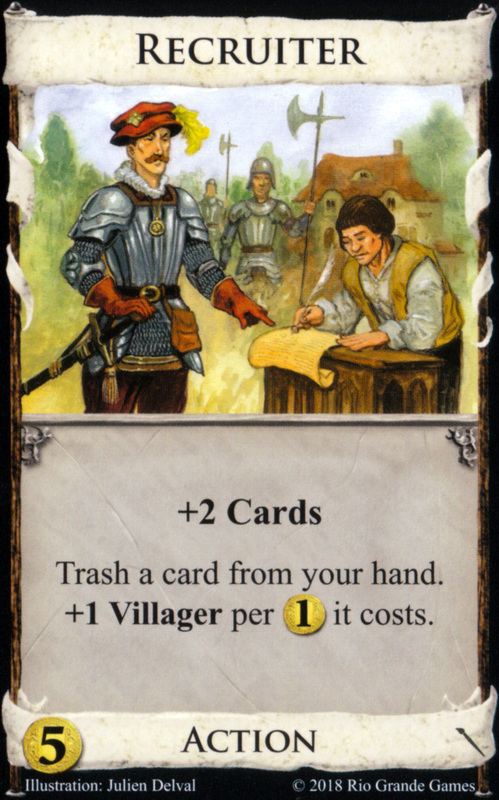 While Lurker does have many amazing combos with nearly all of Dark Ages and Mining Village, by itself the card is usually underwhelming. The primary problem with Lurker is not the ability, which is a fantastic one, but rather the actual card in your deck. Oftentimes, players from across the experience spectrum open with a Lurker, and it’s not always the right play! Here is a likely familiar example to those who have played a couple of Lurker games. It is Player 2 to move. Does Player 2 buy Lurker or not? Usually Player 2 feels obligated to pick one up, just to deny Player 1 from getting his hands on a potential free card. From there, the game devolves into a Lurker game of chicken, where neither player plays the Lurker. Both players feel like they have to justify the Lurker buy, so they pick up other Lurkers. It is understandable that someone would want two Lurkers. Two Lurkers go together as well as peanut butter and jelly. But it is also potentially the wrong play. There is a better solution out there that people don’t contemplate when playing in this scenario, and that is to delay the Lurker buy. Instead of Lurker on Turn 2, buy a better card. Player 2 can gain the Lurker on the second shuffle, and Player 1 still has to keep in mind the Lurker game of chicken. He may go for it, in which case perhaps he gets a second Lurker to increase his chances of landing it upon the next shuffle. This may or may not work, and Player 2’s deck should be slightly the better for it either way. Player 1’s deck will still have at least one glorified Ruined Village inside no matter what the outcome. If you are not going to use the Lurker you gained, there had best be a good reason. Lurkers in hand make it harder to hit price points early game, and there’s no incentive to play it if you do not benefit. A good maxim to remember: Decks that use Lurker are good, but decks that have Lurkers are bad. Do not pick one up blindly, since its presence can hurt an early hand without proper building. Like University, Lurkers are an investment, and so there should be something worth investing in. Usually these investments are pricey cards like King’s Court, Possession, Forge, or Prince. Other fantastic scenarios are anything with Donate, deep quick trashing, Cultist or Fortress combos, etc. Outside of these scenarios, it is a lot harder to justify opening Lurker. The investment put in might very well not be worth it. As the game progresses, Lurker can become less of a gainer and more of a threat of a three pile ending. Always be aware of potential three piles and how many cards your opponent can drain. In particular, Throned or Kinged Lurkers can make games end incredibly quickly, and King’s Court is one of the potential triggers for aggressive early Lurker openings. Lurker is also much stronger with sifters such as Forum. Lurker can gain Actions with Potion cost cards, and the incredibly oppressive one to look out for is Possession. Lurker can also pile incredibly fast with Hunting Grounds! Of course, talking about hypotheticals is fine, but what about actual games? Here are four different boards. Your goal is to analyze the board and assess the use of Lurker (if any). Playing against multiple Torturers a turn will be a slight nuisance despite Masquerade and Lurker doesn’t seem to be doing that many special things here. There’s nothing to invest in. There are cute tricks with trashing Mining Village and Lurker but Conspirator already provides the money. The game looks primed to end on a three pile with Vineyards being prime VP. Lurker seems to be best here as a cheap action and to threaten piles towards the end of the game. This game looks to go on much longer. This is a prime Lurker game. There is an amazing sifter in Forum and good cards to gain in Scrying Pool/Baker/Mill. The engine will be double Province a turn in the ideal world and Mills will help provide points and economy. Lurkers will add cards to make Scrying Pool even better. The game will possibly end on some sort of three pile before the engine can be fully realized, mostly due to Lurker. This board is a Lurker trap. A Vineyard rush with Talisman, Death Cart and Lurker is not even remotely competitive with Colony on the board. The only thing to do here is Council Room Big Money. Pilgrimage on a bad off turn can net a freebie Platinum later on for even faster building. Masterpiece overpay once on an $8 or $7 is a good investment, as Council Room doesn’t mind Silver flood. Lurker needs more support to pull off any sort of rush. Enchantress is easily the most important card here, as it is the only draw, and a good Courtier target as a fancy bonus. Certainly this is not a board where you will get a Lurker on a buy, but rather a wonky turn where you can only get one from trashing an Estate and Coppers with Forge. Lurkers are not terribly important here, although they are nice to get a University which gets Enchantresses and a Courtier. While Forges and Expands are high cost cards and that is a prerequisite for Lurker investing, Baron/Silver or Baron/Enchantress are fine openings to potentially spike $7 already. The draw/sifting is also subpar, although Wandering Minstrel might help to connect two Lurkers. The endgame here seems to be Expanding/Forging things into Colonies. Lurker is a card that a lot of people overbuy, especially in the opening. It is a somewhat mediocre card with a lot of interesting combos. With that being said, it is also a high skill card. That being said, when Lurker is good, it is very good and commands respect. Ignore Lurker at your own peril. Much like how the games tend to go, this guy is forced to Donate. Donate is hard, precisely because it offers the world. The normal limitations of Dominion are erased, and games become much faster. 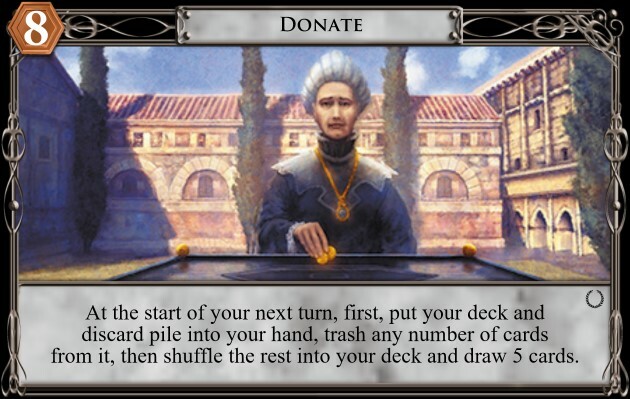 With all of the engine possibilities, it may escape players to envision Donate as a Money enabler. It is true that Donate is first and foremost an Engine card. It is also true that Donate gets rid of Money’s biggest weakness: time. Money strategies can be thought of as a rush of sorts, where you are “betting” that you can get most of the Provinces before the engine can catch up and the game ends. The main problem with Money strategies most of the time is that they are bad at ending the game quickly enough. Donate provides this very speed and consistency to make it happen. It is important to note that Money strategies are still usually bad. However, with Donate they will appear more often than normal. Because of this, it is absolutely worth investing into how Donate Money plays, both as a resource and as a baseline for knowing how much time you realistically have. Memorize this. This baseline is actually incredibly powerful, and will be as strong as some other Donate Money variants. It is important to note that this baseline is somewhat terrible at scoring Duchies while maintaining Province pressure, and will potentially falter against more consistent Money strategies, despite sometimes being just as fast initially. Thusly, Vanilla Donate Money will struggle to put a nail into the coffin of games versus other Money variants, and while it might squeak out a win, it probably won’t. Another thing to consider is the time spent before the first Province. Vanilla Donate Money is at a snail’s pace when it comes to first scoring on Turn 7. If a particular Money strategy is already at 2 Provinces on Turn 7, it won’t matter too much if both strategies get to the same end goal of 4 Provinces by Turn 10. The tempo pressure will be on the Vanilla strategy to buy Duchies in order to not risk simply losing, which has already been established to be a terrible weakness for Vanilla Money. Of course, all of this is contextual. There still is a lot of discovering to do with all of the various types of money plays and lines, but here are some of the more powerful variants, in no particular order. Turn 4+: Always gain Silver with Amulet unless you have $7 in hand, otherwise Amulet should gain a +$1. As it turns out, Double Amulet is pretty okay! Double Amulet not only straight up beats Pure Donate in scoring the first Province, but also in getting more points! Turn 5+: Buy Province, Donate the next turn down, trash everything but Explorer, Province, Golds, and you may keep a single Silver. Don’t be afraid to Province incredibly early, then Donate to finish clean-up the next turn. With the constant influx of Gold, one Silver won’t kill to have around ($8 vs $9, no difference). However, More than one Silver risks 2 Silver/1 Gold hands ($7) which are incredibly sad. For 5/2, you open Explorer and then Donate down to 2 Coppers. On Turn 4, you buy a Silver, Turn 5 is a guaranteed Province, and then you can Donate everything immediately afterwards. On 2/5, you cry, buy nothing/Explorer, hope to draw Explorer T3 and Donate. Turn 5-7: Buy two Provinces and Windfall again in any order, the timing is the same either way. This strategy can hold Duchies well due to the density of Golds, and is highly consistent! Turn 3: Play Market Square, buy Market Square + Donate, keep two Coppers and react all of your Market Squares. This strategy is wicked fast and is one of the best if not the best two card combo in Dominion. Another fantastic thing about this line is how quickly you can pivot into engine play, due to the massive amounts of instant payload and buy. You are not hitting more than $15 a turn without draw support, so use the board to improve on this baseline! Also keep in mind that you can buy an extra Copper at any point to not lose a Gold when triggering additional Donates, if you want to continue gaining Golds. Another strong baseline that while playing similar to Vanilla Donate Money, is just simply faster and stronger. All of these strategies are certainly very fast, and often very predetermined to boot! Are there ways to stop these strategies? What is the best way to trip money up, than the classic attacking method? Good Attacks stop money hard as per the usual. Even with access to Donate, junkers like Witch and Mountebank absolutely gum up most of these money strats, giving alternate strategies time to catch up. Discard attacks can work wonders sometimes, although beware of Gold or Fool’s Gold centric money strategies which only need 3 card hands to work! Of course, for the action centric money strategies like Amulet, Enchantress absolutely tears holes into any plans. Of course, these Donate strategies are still in a lot of ways worse than Donate engines. It’ll be close, but Engines in a lot of cases can end games by Turn 12-13, and should more than catch up by the end. A fast Donate strategy can catch the unprepared slow build engine by surprise, but don’t forget that there are also wicked fast engines. Another disincentive for money is abundance of Alt-VP, which gives the engine player more time to build. Just keep in mind that you are on the clock! Donate money is an incredibly fast variant of Money, and one that poses interesting questions to the player in any given Donate game. However, in many cases these highlighted strategies (among others) only serve as a baseline, as either a way to kick off the engine even faster or to combo with even more cards in the Kingdom, and you may find yourself only implementing the beginning steps of some of these lines. As with any Donate game, always keep your eyes open for better and more efficient ways to do things!